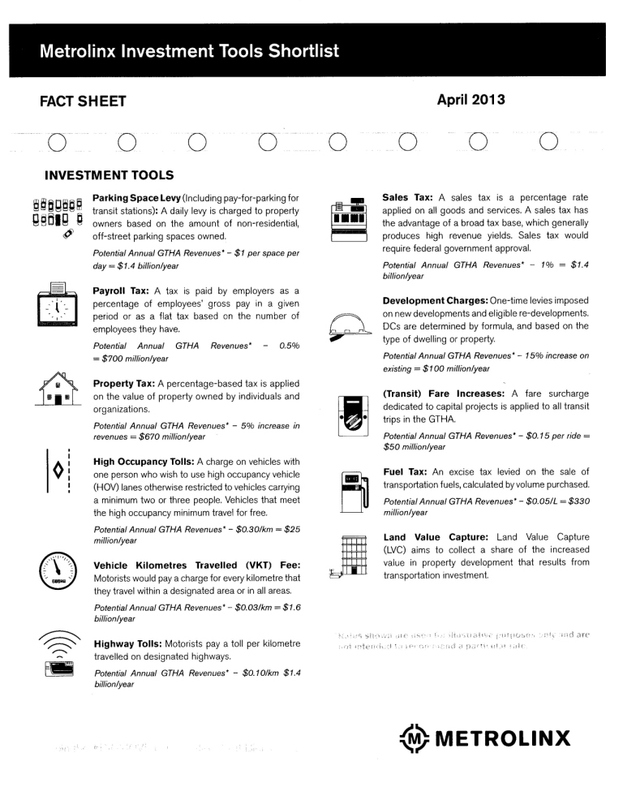 On April 2, 2013, Metrolinx released a list of the preferred “revenue tools” in its forthcoming “Investment Strategy”. Public consultation until today featured a longer list, and several of the options fell off of the table thanks to public and political feedback. 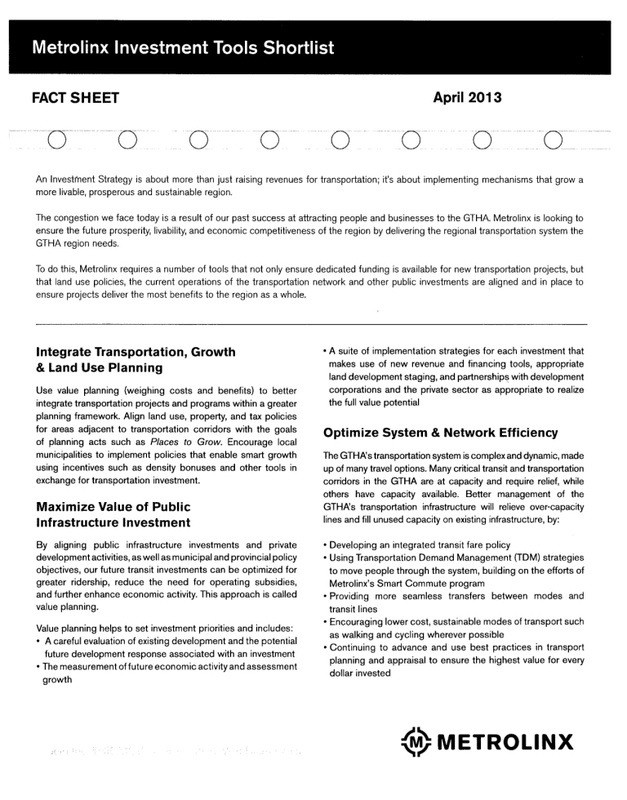 The complete list and a detailed analysis of each option can be found in a 225-page report “Big Move Implementation Economics Revenue Tool Profiles” produced by AECOM and KPMG in March 2013. At a press conference, Metrolinx CEO Bruce McCuaig emphasized that the duty of his organization is to make recommendations, to offer advice, but that the final choice on tools and the amount of revenue to be sought will be up to the politicians at Queen’s Park. This neatly shifts the focus of detailed questions, but avoids the question of just how much detail will be included in those recommendations. A handout we are sure to see during the next round of consultations outlines the general philosophy and gives details of what might be achieved with each short-listed tool. An Investment Strategy is about more than just raising revenues for transportation; it’s about implementing mechanisms that grow a more livable, prosperous and sustainable region. To this I would add that a “strategy” also includes important components such as the staging of projects and discussions about the speed (or lack thereof) with which the full Big Move network is implemented. Today and in the past weeks leading up to the announcement, we have heard a lot about new revenues, but little about how they should be “invested”.